You all know I like reading. I miss my book club. Real Readers gave me an opportunity to keep a book in my hands and discuss the piece with others to gather a different perspective. For over 6 years this has been a missing component in my life – until this past summer. After an exciting start, some things prevented me from joining on the regular. I’m elated to have an end to that piece of my life and add this one on permanently. During casual conversation, a coworker asked if I liked books – of course, I do. She then invited me to the meeting for “Writing My Wrongs” I’m sure you know I’ve read that selection. I was eager to join because I was interested in seeing what others had to say about my friend and checking out the demographic of the group. It was everything I had been looking for: mature conversation, food & drink with a special guest author. This was my kinda event. They added me to the group with open arms. We had several great selections during the second half of the year. I enjoyed reading on the regular again. Between the football games and life, I wasn’t able to make it to all of the meetings. Words really can’t express my happiness but I’ll be here silently reading. During the holiday session, I learned how they decide on the rotation. I volunteered for the month of March and I’m going to do it the same way I use to do Real Readers. Hopefully, I’m moved and settled before the time gets here. Do you have any suggestions for a good reading selection? Please share! 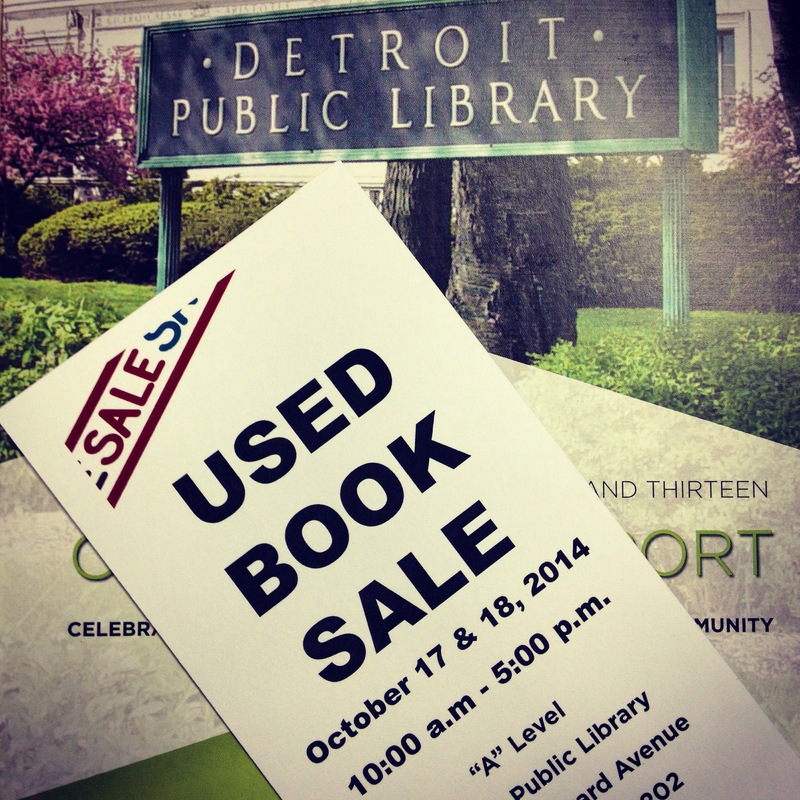 I told you all about the book sale the Detroit Public Library was hosting this past weekend. The book lover and cozy day reader in me got up early equipped with reusable shopping bags gathering coins for the parking meter. I was going to tackle the world before I was due to punch the clock. Get there early was the only thing on my mind. As I pulled into parking space number 6, I noticed the line growing. My strong legs and limited baggage carried me across the street in a hurry. At 10 AM, the doors were unlocked and the herd drove into the basement of one of the most beautiful libraries, which is celebrating it 150th birthday this year. People brought boxes, their suitcases, grabbed available boxes to cash in on the savings. The books they offer are from the library’s collection that have been put out of circulation. Any type if book you can think of is here. All the mass production paper backs are 10 cents, other paperbacks are .50 and my favorite the hardcover books are $1. You can’t even beat that at the thrift store. I loaded up my bag and read the descriptions to books that caught my interest and battled over a few titles. The war was started because I only allowed myself $20 for the event and I had to make the right choices. With my bag loaded with the books I decided to purchase I made my way to the cashier. 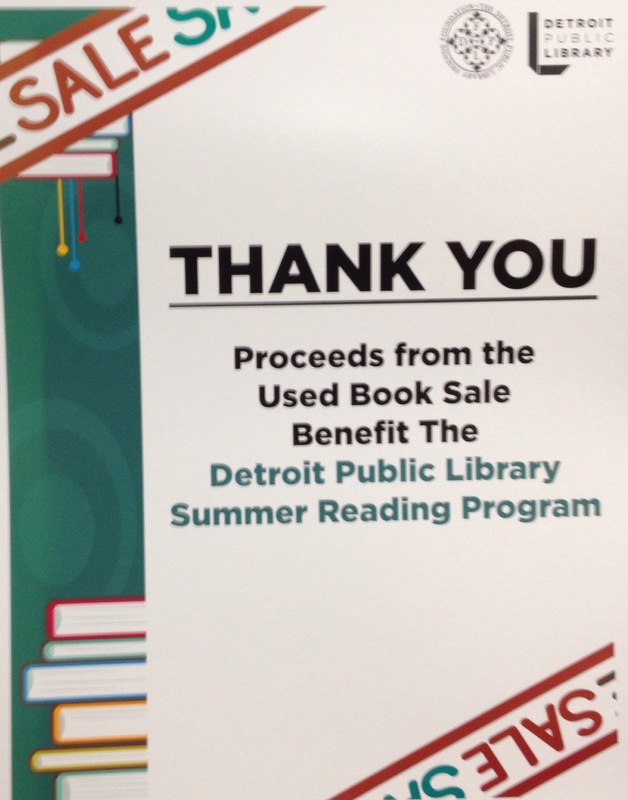 Eighteen dollars later, I emerged from the real readers of Detroit’s speakeasy. Excited about the haul I hurried along with my day eager for day 2. You didn’t think I was done! The second day I usually wait towards the end of the sale to appear. Just to see if there is anything I may have left and what the volunteers have added to the shelf. What literary gem did I discover this time? A pristine copy of “Uncle Tom’s Cabin” by Harriet Beecher Stowe. I wanted it more than anything but day 2 is about pushing my literary boundaries into new genres. My young man helped me pick out a few horror books and knew that he would need to turn my light off at night. I only spent $6 on Saturday for a total of 24 books to read. That’s Beau! Here are the titles from my latest haul. My love affair with Mark Twain continues as I picked up a copy of “Life on the Mississippi.” The author J. D. Mason captured me a few years back and I couldn’t remember if I had read these titles but I picked them up. (I also realized I need to make a list to take with me to reference while shopping next year.). “The New Basic Black” is an etiquette book for people of color and tips about how you should conduct yourself. Major side eye if you feel I should not have purchased this and my niece will being an etiquette class in the near future. It’s needed! The book I’m the most excited about from my time attending this event over the years is an autograph copy of “Roots” by Alex Haley. I guard it with my life. In my Beau Miss decor there’s a big question about, how I plan to store these? Just wait and see! More than any thing else the proceeds of this great event benefit a worthy cause. That makes it a win win! Have you read any of the titles I purchase this time? Does your local library release their books to the public? I would be interested in visiting locations in other cities and communities. This pass summer I indulged myself in the times of long ago through the literary works of fiction. In true book lover form, I grabbed the hard & paperback copy of a few great reads. These stories kept me on the edge of my seat, up late into the night and hauling them around town waiting for someone to say “please wait.” My love for reading and books is true and I’d like to share a few titles with you. The first book I read last season was “Sapphire’s Grave.” This was a complex tale that spanned several generations and is filled with mystery, love and strength. All of this began on a slave ship from Africa. The story takes off and I desired to know more about what happened. 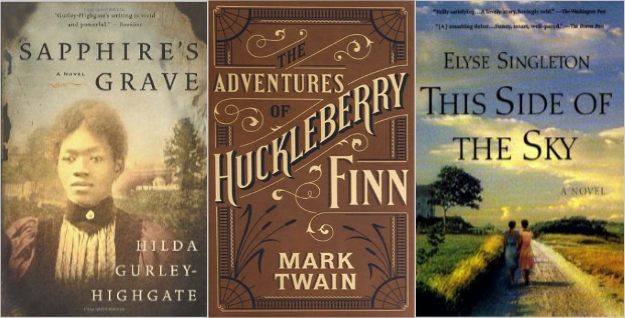 The literary classic “The Adventures of Huckleberry Finn” was my next conquest. Everyone knows I’m a sucker for a good story set in the time of slavery and segregation. I found myself cheering, crying irritated and smiling all while reading. I know some of you may be thinking – “Didn’t she read that in school?” Uh no! Detroit Public Schools or my teachers failed to expose me to this fabulous tale of overshadowed with the unflattering portion of American history. During my visit to John King Books last year, I picked up an unedited copy. This story will remain in my mind forever and I certainly understand why Mark Twain is considered one of the greatest. I can check this one off the 50 book challenge, now! The summer season closed out with, “This Side of the Sky.” This book packed a lot in 320 pages. The four part encounter takes you on a journey of two friends from Mississippi to Paris. I really don’t like to spoil a story for others. All I can say is, I passed the book along to my sisters and their reading pleasure. Are you still a page turner or have you adapted the technology and convenience of ebooks? Would you be interested in a haul video from the book sale? I don’t know if you all remember but I use to be involved with the Real Readers Book Club. 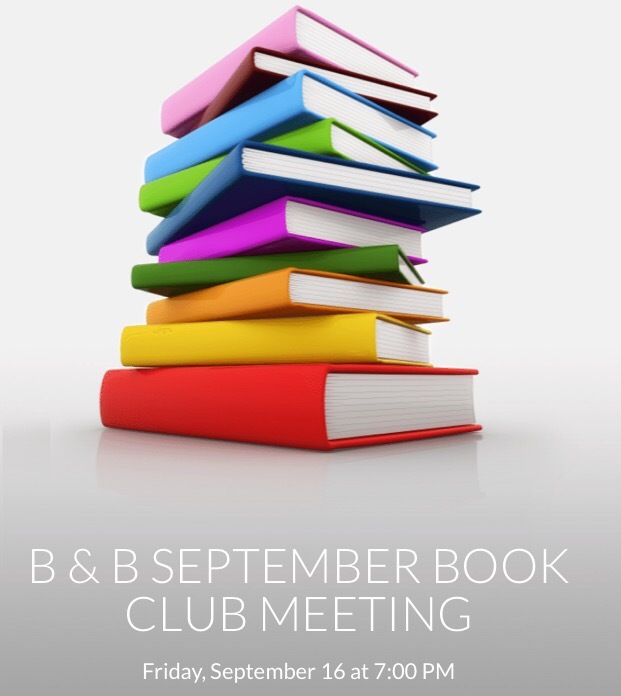 It actually was my book club but I had to let it go. Women, scheduled and synchronized scheduling do not work well together. Books are something like my BFF right next to music. So, the other day I went to Barnes & Nobles just to see what might interest me. Being the one that always jots down the title of a piece of literature. I had a few titles in my notebook to check out. I found a few things that interested me but it wasn’t the haul I expected. On my way to the register, I looked at the many impulse items they have in the aisle. Now, any book lover has a collection of bookmarks. We buy them almost every time we get a new book, see a stack of them free ones they offer at the library and let’s not forget our trusty handcrafted version made out of almost anything. However, I looked at the carousel of bookmarks. I like one that has a cute picture or inspirational quote etched into the material. As I looked at the selection this 7″ x 1 1/2″ metal page holder caught my eye. It was different. 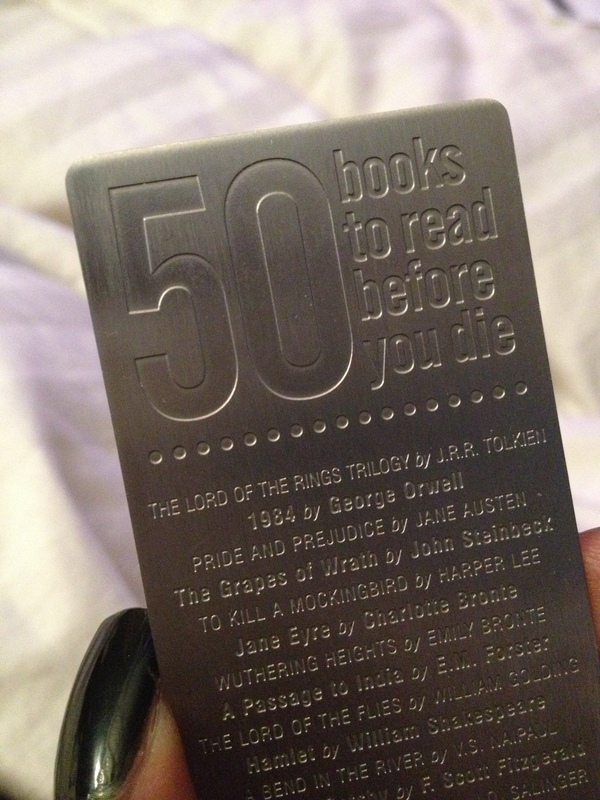 The title across the top read “50 books to read before you die.” Really!! Now, I’ve read more than 50 books in my 33 years on this Earth. So, I know I’ve had to have read a majority of these books because I read everything. I picked it up noticing that it wasn’t in any specific order because the best selling book of all time was mashed in the lower portion of the list. With a need to be at work within the next 30 mins I grabbed it and decided to check, how many of the books listed had I read. As I checked over the titles I realized out of all the books I had read I hadn’t put a dent in this list. Out of all the titles on this piece of metal I had only read 6 titles. More than shocked, I was ashamed. So, I accepted the challenge! I love to read and there are some real classics here. Classics, unexpected and obvious titles were all sandwich on this little insignificant page holder. This list may not match up with any other list of great books. Hell, I’ve read a few great books that aren’t here. That doesn’t make them any less great. Here is the list exactly how they have it pressed into the metal. The stories that I have read are the ones highlighted in the pink font. I’m open to exploring new titles. Those two series included in the required reading that have been produced as major motion pictures. Might get the old movie review. There are two titles that I read in high school but that was 15 years ago I might read them again. Literacy is essential to the strength of the brain. If there are any titles that you feel I should read 1st, let me know. As always 🙂 it might help someone else more than yourself. 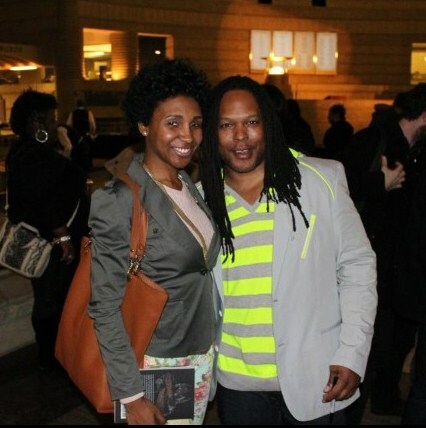 Beautifully Misunderstood stopped Shaka Senghor of Drop A Gem Publishing for the “Happiness Quest” inquiry. 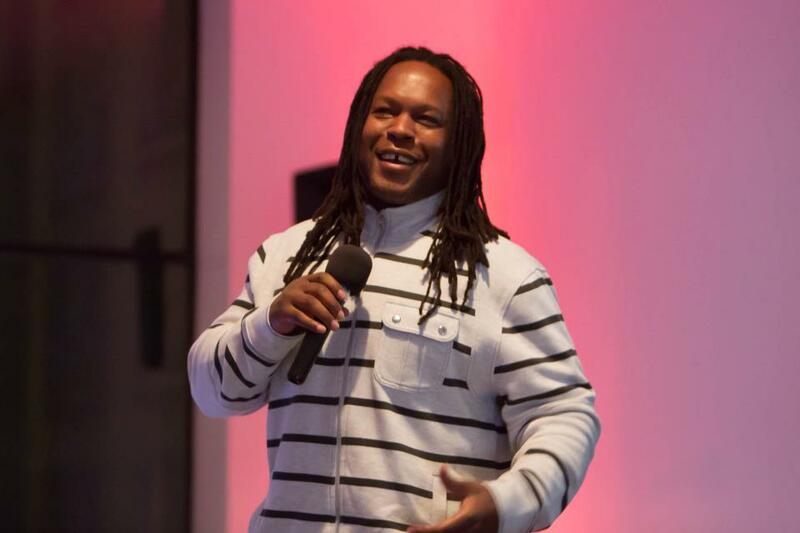 Mr. Senghor is a writer, mentor, and motivational speaker whose inspiring story of redemption has captured the hearts and minds of young adults across the nation. During a 19 year prison stay, Senghor discovered his love for writing. In total six books have been written, including a NEW memoir about his life, Writing My Wrongs. 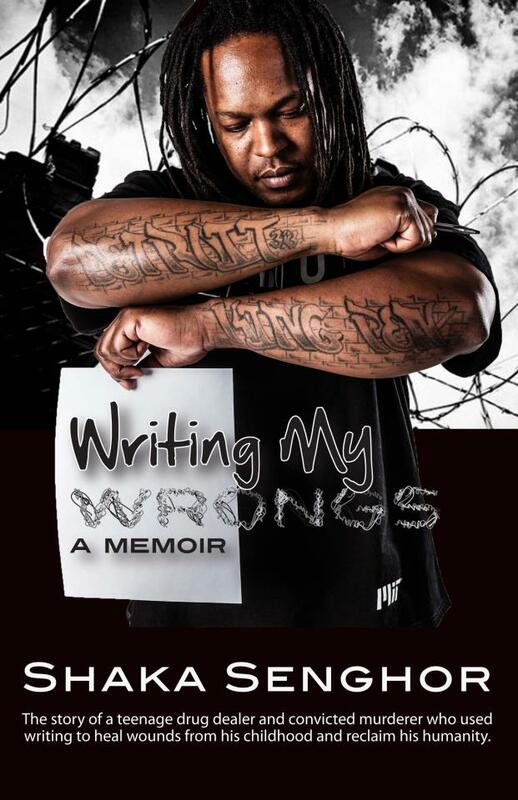 He is the “King Pen” behind the detective series Crack: Volume 1 and 2, and a book of his writings entitled Live in Peace: A Youth Guide to Turning Hurt into Hope, a companion piece to his mentoring program. Shaka has worked with youth at the Detroit Job Corps and many area high schools; has lectured at the University of Wisconsin–Platteville, the University of Michigan, Fordham University, Wayne State University, Marygrove College, and Pace University; and is an invited guest on local radio and television programs. Most recently, he has been working with the MIT Media Lab on a project to strengthen Detroit through a creative initiative. Now, I met him out here in cyberspace and had the opportunity to get to know him personally and build a genuine friendship. He calls me his “Business Partner.” I won’t deny that. After taking an active role in promoting his literary works through several groups and reading the books – my respect for him, what he’s doing, where he had been and more importantly where he wants to go, grew. Beautifully Misunderstood asked him the same questions we ask everyone and he had not problem in answering. Who inspired/encouraged your movements/change? My greatest inspiration for changing my life is my father James White. He is the epitome of a father and a great man. He encouraged me to always maximize my potential and to never give up in life. He was by my side during my lowest points and encouraged me along the way. What risk (if any) did you take to follow your happiness? The risk I took to follow my happiness was trying a new route and understanding that the road would be harder to travel, because I had to pave it as I went along. The easiest thing would have been to go back to my old ways, but instead I risk it all by embracing a new way and starting a new path. How long did it take you to embrace the move toward happiness? It took a very long time for me to embrace the move toward happiness. Prison isn’t an environment where happiness is celebrated or embraced. I had to do a lot of soul-searching and cleansing internally and externally. I had to get rid of all my negative and toxic thoughts and then get rid of the negative and toxic people in my life. It was a process because some things are habitual including the company we keep. However, I love that I am still growing into my happiness and embracing the positive side of life and all it has to offer. Where would you be had you NOT followed your happiness? If I hadn’t embraced my happiness and the things I now believe in, I am sure I would be just another statistic caught up in the same destructive cycle. The thing is I can’t imagine being trapped in that sick twisted world anymore. I am happy my spirit of determination keeps me progressing toward the positive light. It’s a great feeling to be in control of my destiny instead of having my destiny controlled by someone else. Sum up your journey in one sentence…. Obstacles can be overcome and broken spirits can be mended, it’s all a matter of having the will and determination to do it. Beautifully Misunderstood shined the spotlight on Shaka for his steadfast and genuine transition from being a part of the problem to making strides toward finding solutions and becoming an impactful factor in the community. There’s always so much focus on the negativity in the city that we miss real turn around stories such as this. Detroiters and people across the globe have embraced his literature and programs that he has concentrated his energy into. He has by far become one of the people I truly enjoy conversing with even if all we do is laugh. I admire him for taking a chance and creating a life for himself, a legacy for his family and most importantly dispelling the idea that he would return to the life he emerged from. That summary of his journey will probably stay with me for the rest of my life.. Might even make it up there to be one of my all-time favorite quotes. To learn more about Mr. Senghor go to his website http://www.shakasenghor.com/. Here you can make contact for speaking engagements, locate events and most importantly purchase books and I must say (unbiased in any way) that “Writing My Wrongs” was a real page turner. As always keep dreaming, moving in the path of your HAPPINESS and :).